The leadership of Pharmaceutical Society of Nigeria (PSN) recently led a strong delegation on a courtesy visit to the head office of World Wide Commercial Ventures (WWCV) in Matori area of Lagos. Welcoming the team, Pharm. Lucky Ubokor, superintendent pharmacist of the company expressed delight at the massive turnout of the delegation members. “I want to specially thank Mazi Sam Ohuabunwa and his entourage for this visit because we understand that the highest honour a community can get is to have its chief coming to visit them in person..
“My prayer has always been for God to strengthen you to carry this cross because I know the stress that comes with occupying the office of PSN presidency,” he emphasized. Shortly before they were taken on a tour of the company’s ultra-modern facility, Santosh Kumar, managing director of the company updated the delegation on the operation of World Wide Commercial Ventures since inception. “WWCV has a business history of 150 years. Presently, we cover about 4,500 pharmacies, 800 hospitals, 200 clinics directly and another 1,000 indirectly. In our fold, we have 1,100 staff (which has grown from 250 that we started with in 2008) across 10 branches and 30 agencies nationwide. L-R: Pharm. 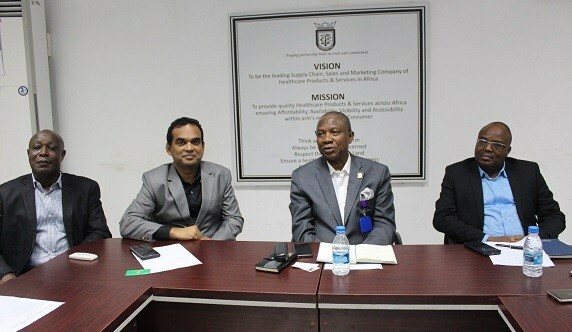 Lucky Ubokor, superintendent pharmacist, WWCV; Santosh Kumar, managing director of the company; Mazi Sam Ohuabunwa, president, Pharmaceutical Society of Nigeria (PSN) and Pharm. Yemi Olalere, pharmaceutical director, WWCV at the reception. “Currently, WWCV has 30 per cent share of the total market and are in partnership with 39 local and multinational companies. As you can see, we have indeed come a long way and remains Africa’s leading route-to-market solution,” he noted. Kumar also showcased some of the laurels and recent awards such as the Compliance Award given by National Agency for Food Drugs Administration and Control (NAFDAC) and the prestigious ‘Companies to inspire Africa – 2019’ Award by London Stock Exchange Group to the PSN delegation. 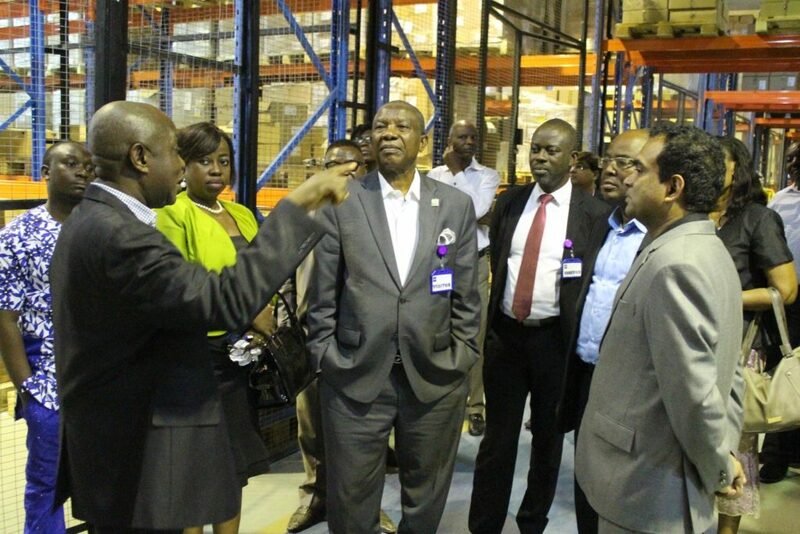 Apparently impressed with what he has seen so far, an excited Mazi Sam Ohuabunwa, president, Pharmaceutical Society of Nigeria applauded the efforts of WWCV management team, saying they are an ideal example of how a modern logistics and distribution company should run. “Until today, I didn’t even know WWCV has span 17 years in this country. I want to appreciate the quality of service you are rendering to the pharma industry. You are indeed a pacesetter. “I know that with your exploits, many will be encouraged to also come and set up in Nigeria. From experience, I know that distribution is a specialized function, distinct from other features,” he stressed. Reminiscing, the PSN boss remarked that there were some level of misunderstanding about the activities of WWCV in the past. “In the past, some marketers were aggrieved about your perceived roles in the industry. Today, I am happy that roles are being defined. We have since cleared the air that no work is being hijacked from anybody. “There is no other way to expand and improve other than to continue to collaborate with organisations like WWCV. This is one major means to checkmate distribution of illegal and unregistered drugs in the country. There will always be records to trace such transactions,” he reassured. In attendance were Pharm. Emeka Duru, national secretary; Mrs Adefolake Adeniyi, national treasurer; Ignatius Anuku, chairman, Association of Industrial Pharmacists of Nigeria (NAIP); Pharm. Oluwatosin Adeyemi, editor-in-chief, Nigerian Journal of Pharmacy; Pharm. Okeme Okah-Ayae, medicine information manager; Victor Afolabi, CPC vice chairman; Pharm. (Dr) Ejiro Foyibo, deputy president, PSN (South); and Chimezie Ukpai, personal assistant to the PSN president. Other WWCV officials in attendance included Pharm. Yemi Olalere, pharmaceutical director; Pharm. N. V. Madhusudan, manager; Pharm. Udey Patil, key account officer; Pharm. Victor Adekanye, key account officer and Pharm. Daniel Uwandu, zonal manager. World Wide Commercial Ventures Limited (WWCVL) is part of South Africa based leading logistics and distribution company Imperial logistics and is a licensed vendor to all major healthcare providers in Nigeria. It has also been described as a one-stop solution for warehousing, pharma marketing, supply chain, Sales& Marketing regulatory , port clearance, transportation logistics and inventory management. WWCVL houses many great companies such as GSK Pharma, Pfizer, GSK Consumer, AstraZeneca, Novartis, Johnson & Johnson, Danone, Sanofi, Merck , Neimeth , Drugfield , Gemini .Novo Nordisk, Boehringer Ingelheim, Janssen, Sandoz, Strides and Roche. Getz, Shalina Healthcare, Pharmadeko and Daily-Need Industries are the latest addition to the family.